As a business owner, have you ever stopped to smell the roses? You have a good mix of employees on hand, yet some of them come and go like there is a revolving door at the entrance of your company. While things have changed since our parents spent 30 or 40 years at one company, that doesnât mean you need people coming and going like at a yard sale. 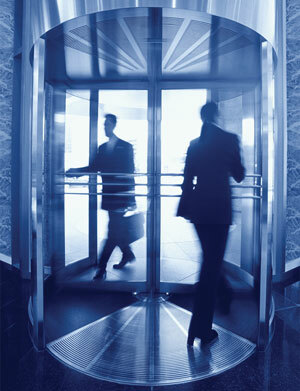 For those employers tired of the revolving door, stop and review your companyâs practices when it comes to hiring and firing. Training process – Have you ever taken the time to review your training methods for new employees? Given most companies have probationary periods of anywhere from 30 to 90 days, review your process to see if it is productive or not. Since your company spends time and effort on training new employees, you donât want the door opening and closing every after youâve successfully trained an employee. Not only have you wasted their time, but also the time of those on your staff who trained the individuals. Employee satisfaction â It is inevitable that some employees will get the âseven-year itchâ and want to leave, oftentimes before seven years. That being said, what are you doing to keep employees motivated, happy and successful? When an employee is at your company for several years, they develop relationships with both your staff and your customers. Should they leave, you then have to find the right piece to the puzzle to make sure the next employee co-exists well with others. Encourage them not to leave by providing opportunities for growth and happiness within your company. Managerial skills â For every 100 good managers, there are always handfuls that stop just short of terrorizing your employees. Whether it on purpose or by accident, they are not doing a very good job relating to those under them. That being the case, some of your employees are working on their resumes during the day when theyâre supposed to be working for you. While regular employees get reviews, it is important for business owners to review the efforts of their department managers. Meet with those working under the managers to see if theyâre happy with the direction the managers are taking. Are they letting those under them be creative and do their jobs, or are they micro-managing them to the point the employees are tuning out? A bad relationship with oneâs immediate boss is oftentimes the top reason solid employees leave a company. Meeting employee needs â While there have to be rules in place in every office, business owners who canât have a little flexibility will oftentimes see good employees say bye-bye. Whether it involves medical issues, children, commuting etc. company heads should offer some leeway when it comes to an employeeâs personal matters than only can be met during the 9 to 5 day. Companies that do not allow employees to meet such needs either through excused absences or making up the time run the risk of losing these individuals over time. Room for growth â Does your company have an environment where employees can grow and achieve their career goals or are they left just spinning their wheels? Whether it is through financial incentives, opportunities for more of a say and how things work, time off from work, be sure to have some markers in place where your employees have added motivation to do a good job. Nothing turns an employee off more than knowing that theyâre essentially in a dead-end job. While business owners must decide what is best for their companies and not follow everyone else, it is important to have a culture in the workplace where employees come to work each and every day motivated. For those companies whose employees just show up because they need a paycheck, expect that front door to get a lot of use over time. Dave Thomas is an expert writer on items like credit card processing and is based in San Diego, California. He writes extensively for an online resource that provides expert advice on purchasing and outsourcing decisions for small business owners and entrepreneurs at Resource Nation.